Hetrogenous’ TowerSTAYTM platform uses integrated hardware and connected cloud software that enables tower administrators to remotely monitor and actively control vital cell tower functions and parameters and streamline operations while driving accountability and visibility. Integrated hardware that monitors sensor data from TowerSTAY™ nodes, performs edge processing, connects to the TowerSTAY™ Cloud, and allows remote control of key operations through the nodes. Powerful data analytics platform that enables real-time data aggregation and secure mining of massive amounts of data. Enables cell tower management, facility automation, and decision support capabilities for streamlined operations. Data dashboard accessed through mobile thin-clients that provides remote tower administrators with an in-depth view into the various aspects of a site through contextualized and visualized data along with remote controls. 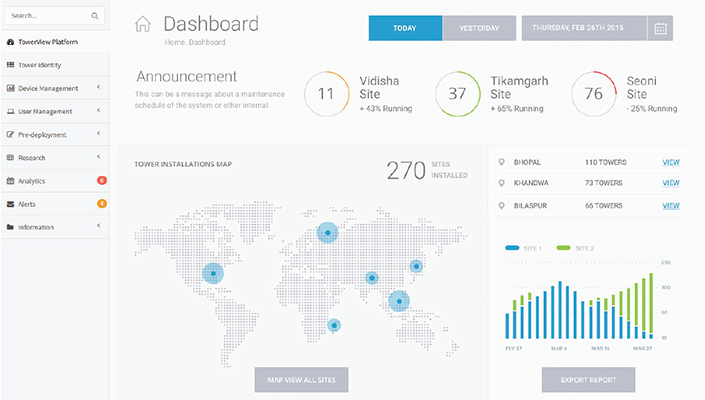 Hetrogenous’ TowerViewTM is a dashboard solution that gives remote tower administrators total operational visibility and advanced analytics with an intuitive user interface. As the value chain of the telecommunications industry continues to shift from voice, SMS, and data services to delivering content and powering the IoT, Hetrogenous’ platform enables providers to keep up with the transformation and create new revenue opportunities. Enable IoT connectivity to customers and vertical markets. Hetrogenous’ platform enables telco companies to partner with IoT device and service providers, application developers, and third parties to create bundled IoT services. Hetrogenous’ platform delivers vastly improved IoT user experience for customers by ensuring high-speed access and connectivity to IoT-enabled devices, reliable support through remote monitoring, and all-around performance improvement. Hetrogenous enables enterprises to collect, process, and analyze data gathered from IoT devices, networks, and applications in real-time.